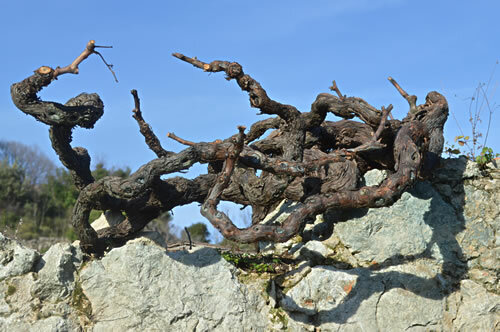 Do old vines make wine with more character? It certainly seems as if they should! We drove past this wonderful vineyard near Svirče a couple of months back, when the vines were all neatly clipped. With no leaves, the old twisted trunks showed boldly against the rocky terrain. Old vines trying to escape? 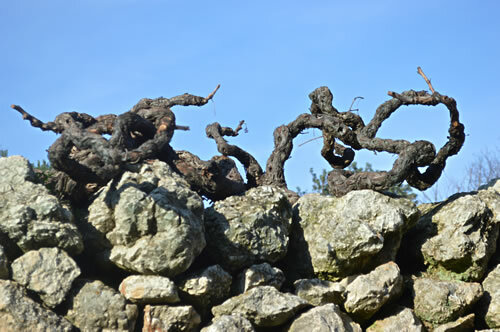 From the road, it almost seemed as if the vines were the tentacles of some creature trying to escape over the wall! 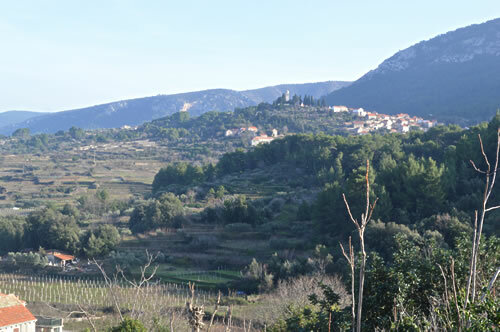 This area around Svirče is known for its terraced vineyards. Although this is on the north side of the mountain, it is fairly well protected from the chilling effects of the bura in winter. And this vineyard has clearly been here for some time. 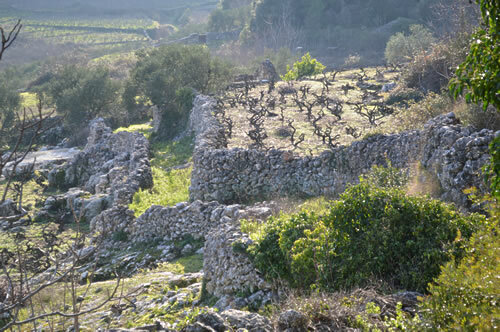 There’s a combination of natural terracing, and constructed dry-stone walls supporting the pockets of soil where the vines are planted. It looks a very stark environment, even on this sunny day. The vines would need to develop deep, wide root systems to grow and thrive here. 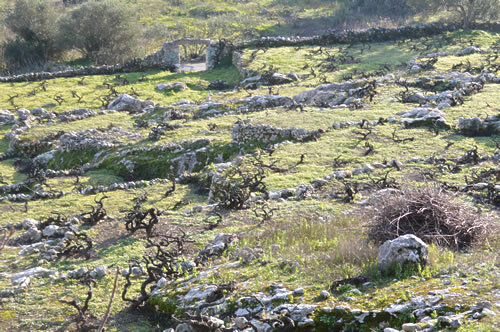 And clearly they do thrive, as these Plavac Mali vines would appear to have been here for some time! This particular vineyard is owned and operated by a member of the Carić family, and is right next to the lovely village of Svirče. 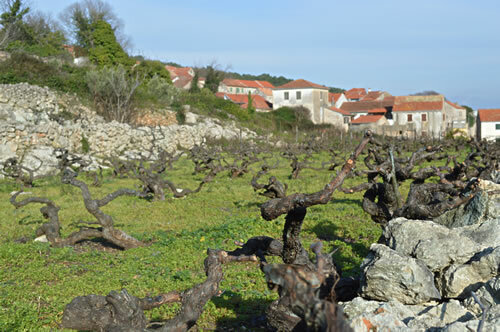 You could consider that to be the heart of Hvar’s wine country, where almost everyone has a vineyard! The roads providing access to the vineyards demonstrate the long-term cultivation patterns here. 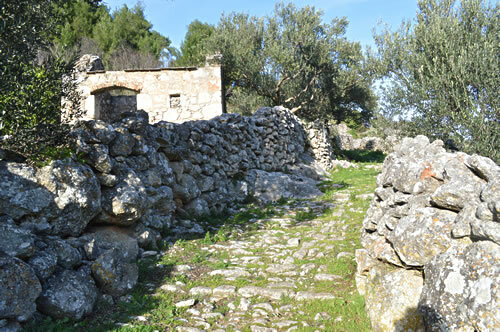 This stone-paved “street” leading up into the fields from today’s road is one of the double-width access paths, able to take a donkey and cart. On either side, the fields are surrounded by dry-stone walls that both delineate and hold in the soil. On the steeper sections, the street may be single-track only – just room for the farmer on foot, or with a donkey! 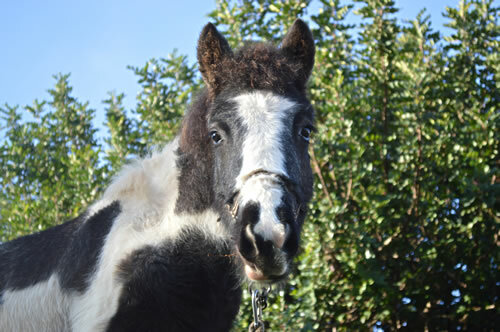 We didn’t see any donkeys up here, but a friendly pony looked curiously at us from the other side of a wall! The views from here were very pretty! Aside from our new friend in the next field, we could see across the valley to the nearby village of Vrisnik, tucked up high on its hill. And in the valley between are some of the other vineyards of this wine country. In the flatter areas the vines are neatly laid out in clipped lines. 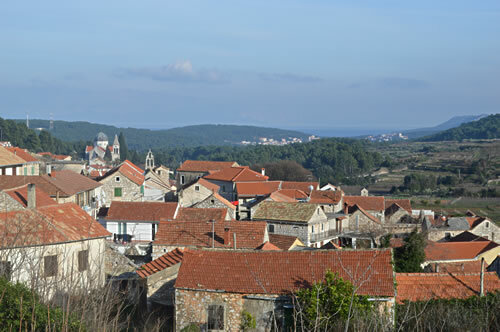 From up here, we can see over the rooftops of Svirče, a jumble of stone houses, red roofs and further off, that distinctive domed church. 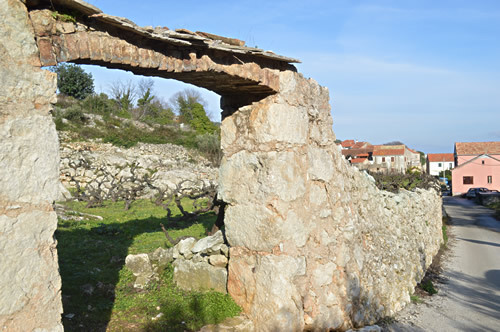 There are two wineries based in this village – Carić Wines, and the cooperative PZ Svirče. Both of which produce some excellent wines! So, back to my original question: do old vines make wine with more character? Well, opinions differ, naturally, but it seems that potentially, they can provide a more layered complexity to wine in a more consistent way. 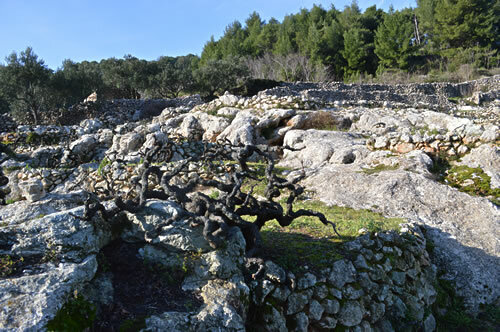 It’s the same point about terroir making a difference, as older vines have a wider-spread and deeper root system. That makes them more resilient to extreme weather conditions and diseases. I’m pretty sure I can taste the rocks and minerals in a glass of Plavac Mali wine, and it certainly adds a lot of character for me. It relates directly to this beautiful landscape, and the amazing places where vines have cultivated for centuries. 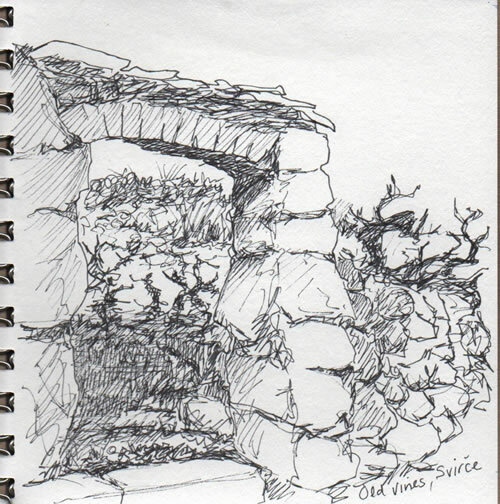 I love things with character — vines, rocks, ponies, people! Great photos and comments.